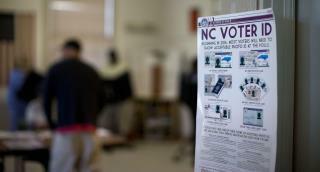 (Newser) – A restrictive 2013 North Carolina voter ID law was struck down for being passed with "racially discriminatory intent," Politico reports. Three federal appeals court judges ruled unanimously Friday that the law violated both the Constitution and the Voting Rights Act. Judge Diana Motz says North Carolina lawmakers passed the new voting restrictions "in the immediate aftermath of unprecedented African American voter participation in a state with a troubled racial history and racially polarized voting." According to the Charlotte Observer, North Carolina voters will no longer be required to show a photo ID when voting, and 16- and 17-year-olds can once again pre-register to vote. The ruling also brought back a week of early voting, the Washington Post reports. Just in time for Hillary's mass voter fraud program. It's pretty obvious she has no chance of winning without it. North Carolina - a sewer of supernatural insanity. Why are the most "religious" places a Hell on Earth? Why is having to show ID racist?